Since the early 1990s, there has been a resurgence of interest in studies aimed at the molecular dissection of the amphibian pronephros, the larval kidney of the frog. In general, the pseudotetraploid Xenopus laevis has been the experimental amphibian of choice; however, with the genetic advantages afforded by its diploid cousin Xenopus tropicalis, this animal will surely soon enter the frame. Xenopus tropicalis, although somewhat smaller in size, has much faster development than Xenopus laevis, reaching maturity in 4 to 6 mo. This coupled with its diploid genome makes the possibility of successful genetic screens a likelihood rather than pure fantasy. For those whose major interest is the pathology of the human kidney, it might seem an obscure choice of developmental model in which to study the vertebrate kidney. However, during the course of this, review I hope to convince the skeptical reader that Xenopus actually is a prince among models for vertebrate kidney organogenesis, which can provide new and exciting functional information to all researchers who have an interest in nephrology. The kidneys of higher vertebrates form from three successive structures: the pronephros, the mesonephros, and finally the metanephros. Each of these forms is progressively more complex in the number and organization of the nephrons, and in mammals, only the last two forms are functional. However, the formation of all three forms of kidney is essential, with each subsequent organ being dependent on the presence of the former structure for its origin (1). The successive derivation of progressive kidney forms occurs throughout vertebrate evolution. As some of the molecular steps involved in early induction, patterning, and differentiation events are established, it has become clear that recapitulation of genetic programs that control these development programs occurs (reviewed in 2–5). Because the pronephros is the first and simplest structure to form, this perhaps makes it an appropriate place to start to unravel the mysteries of kidney organogenesis. However, in higher vertebrates, the pronephros forms only as a rudimentary organ that does not function. Furthermore, the embryonic stage at which pronephros formation occurs is inaccessible in utero; thus, an alternative system in which to study these earliest events is essential. The frog can provide such a system. Xenopus can be hormonally stimulated to produce eggs throughout the year. These eggs can be fertilized in vitro, and then all subsequent development occurs in either water or simple salt solution. No feeding is necessary until approximately 6 d of development, by which time all of the major organ systems have formed and are functional. The large size and external development make the frog embryo easy to manipulate. Thus, grafting; explanting small pieces of tissue; and microinjection of DNA, mRNA, and protein all are possible, making the frog embryo one of the systems of choice to identify the function of molecules during development. Considerable progress has been made on both the developmental and the molecular events that take place during pronephros formation (2,4,6–8). The pronephros is a simple nonintegrated nephron that forms from the intermediate mesoderm on either side of the embryo. This simple paired organ has three major compartments: the glomus, tubules, and duct. The glomus forms from the splanchnic intermediate mesoderm and is the vascularized filtration unit. It projects into the coelomic space, where blood filtrate is released (8). The tubules form opposite the glomus from the somatic intermediate mesoderm and form a convoluted mass. Three nephrostomes, ciliated funnels, open into the coelom and function to drive waste from the coelom into the tubules (6). The nephrostomes open into the collecting tubules, which leads to the common tubule. The common tubule eventually joins the pronephric duct, which opens to the exterior via the cloaca (7). The study of each of these components has been aided by the discovery of molecular or immunohistochemical markers that decorate each of these structures in a specific manner (9). Figure 1 shows each of these component structures and their positional relationship to one another. Vertebrates that live in a freshwater aquatic environment have to have active excretory systems to excrete the excess fluid that enters the body through the skin. Larval amphibia are no exception to this and as a consequence need to actively reabsorb salts to prevent ion depletion. The pronephros functions by the same filtration and resorption processes as any other vertebrate nephron, and the process has to be highly efficient (10–12; reviewed in 6). The urine in amphibia is delivered into the coelomic space after filtration in the glomus. It then enters the larval nephron via ciliated funnels, the nephrostomes, which drive the urine into the pronephric tubules. Aquatic amphibia, such as Xenopus, excrete ammonia that readily diffuses away in an aquatic environment rather than urea. Urea is produced by amphibia only after metamorphosis and the adoption of a terrestrial habitat. Once in the tubules, a variety of transporters and co-transporters ensure the setting up of an electrochemical gradient and the efficient absorption of salts and other macromolecules in an analogous manner to that achieved in higher vertebrate kidneys. The pronephros forms between the paraxial mesoderm (presumptive somites) and the lateral plate just ventral to somites 3 to 5. All of the components of the pronephros arise from mesodermal tissue, and little is known about the signals received by presumptive pronephric mesoderm that instruct it to become the pronephros. It is known, however, that a number of different signals that induce and pattern the structure are given. The anterior somites are essential for pronephros development and provide an essential first signal. If the body plan of Xenopus is perturbed and somites disrupted, as occurs in ultraviolet-treated embryos, then the pronephroi do not form (13). Furthermore unspecified intermediate mesoderm from the pronephric region can be instructed to form pronephric tubules in tissue recombination experiments with dissected anterior somites. The exact timing and nature of this signal is as yet unidentified, although we know that it is relatively localized to the anterior somites. It is thought that perhaps this signal is responsible for setting up the pronephric field. The downstream targets of this signal are the transcription factor Pax8 and the LIM/homeodomain protein Xlim-1. It is likely that Xlim-1 is essential for pronephros development because it is essential for all aspects of higher vertebrate kidney development. Furthermore, when dominant negative Xlim-1 constructs are overexpressed in Xenopus embryos, development of the pronephric tubules is inhibited at early tailbud stages. This suggests that Xlim-1 is not essential for the initiation of the pronephros but is essential for the subsequent growth and elongation of the pronephric tubules (14). Initially, Pax8 and Xlim-1 have different expression domains, suggesting that they are regulated by different signals. It has been suggested that Pax8 acts as a maintenance factor for Xlim-1, although it is unclear what activates Xlim-1 in its initial domain of expression. The region of the embryo, which expresses both Xlim-1 and Pax8, includes all three domains of the pronephros: glomus, tubules, and duct. Subsequent patterning events in the pronephric anlagen show that mediolateral patterning has occurred. The Wilms tumor gene-1 orthologue xWT1 is expressed only in the medial portion of the pronephric anlagen, consistent with its later distribution in the glomus (15). This distribution may result from the inhibitory influence of the epidermis on xWT1 expression perhaps via BMP signaling. xWT1 also inhibits the expression of Pax8 and Xlim-1, thereby confining their expression to the lateral portion of the pronephric anlagen, which will give rise to the tubules and duct. Final patterning events involve the dorso/ventral patterning of the anlagen exemplified by the Wnt-4 expression pattern. At stage 26, this is restricted to the dorso/lateral component of the pronephros (16) and members of the Notch pathway (Serrate and Delta), which also become localized in the dorsal compartment (17). Activation of Notch signaling specifies “not duct,” thus defining a compartment of the pronephros that gives rise to the tubules (17). These molecular signals are accompanied by morphologic changes. The first sign of pronephric segregation is a change in cell shape in the somatic intermediate mesoderm at early tailbud stages. The glomus also starts to form at this stage, the glomus primordium being split off from that of the tubule and duct as the intermediate mesoderm is split into splanchnic and somatic mesoderm by the formation of the coelom (8). Shortly after the tubule primordium has formed, it starts to change shape, indicating its final pattern. The dorsal edge becomes molded to indicate the position of the three nephrostomes, and ventrally, the most distal element of the tubule is thrown anteriorly. By stage 25, the main body of the pronephros is obvious as a solid mass of cells below somites 3 and 4 and the duct has started to extend posteriorly to the cloaca. The nephrostomes are first evident at stage 28. From stage 30, the tubules start to develop a lumen. The pronephros becomes fully functional at stage 38, but the tubules continue to coil, forming a convoluted mass by feeding (6). Having set out some of the molecular players and morphologic events that occur in pronephros development, we now consider some of the advantages afforded by this amphibian experimental system. One of the major advantages of amphibian embryos is that development occurs in simple saline solution throughout the stages when normal organogenesis occurs. Small explants of material can be dissected from early embryos and cultured in the presence or absence of growth factors. Such tissue is conveniently dissected from the blastula-stage embryo, when the embryo consists of two basic types of cells: those in the animal pole, which will give rise to epidermis and neural tissue, and those in the vegetal region, which will give rise to the endoderm or gut. The mesoderm arises at the equator, after an inductive event between these two cell types (18). The animal pole cells can be dissected with an eyebrow hair knife to give an animal cap (Figure 2A). This material if cultured in saline alone will differentiate into atypical epidermis but if treated with the growth factor activin at 10 ng/ml and retinoic acid at 10−5 M will differentiate to pronephros at high frequency (19). These induced pronephric tubules express genes characteristic of pronephric differentiation in the correct sequence and approximately the same time at which they would be expressed during normal development, suggesting that the material induced in vitro parallels normal development (20). These pronephroi, induced in vitro, have been shown to be functional when transplanted into nephrectomized host embryos (14). Initially, it was thought that only pronephric tubules were induced in this way, but now it is clear that conditions can be identified in which duct is also able to differentiate, using 10−4 M RA and 10 ng/ml activin (21). Reverse transcriptase–PCR analysis for the glomus molecular marker xWT1 also defines conditions for glomus tissue development (22). Thus, all of the components of the pronephros can be induced in vitro. This ability to generate pronephros tissue in vitro has been invaluable in the development of the subtractive hybridization strategies used in the identification of new genes expressed in the pronephros (20,23,24). In fact, the animal caps can act as a source of undifferentiated cells that are capable of differentiating under the appropriate treatment into a wide variety of cell types (reviewed in 25). Animal cap and explant studies have also been used to define the time at which signals are given to intermediate mesoderm to instruct the formation of the pronephros (22,25). 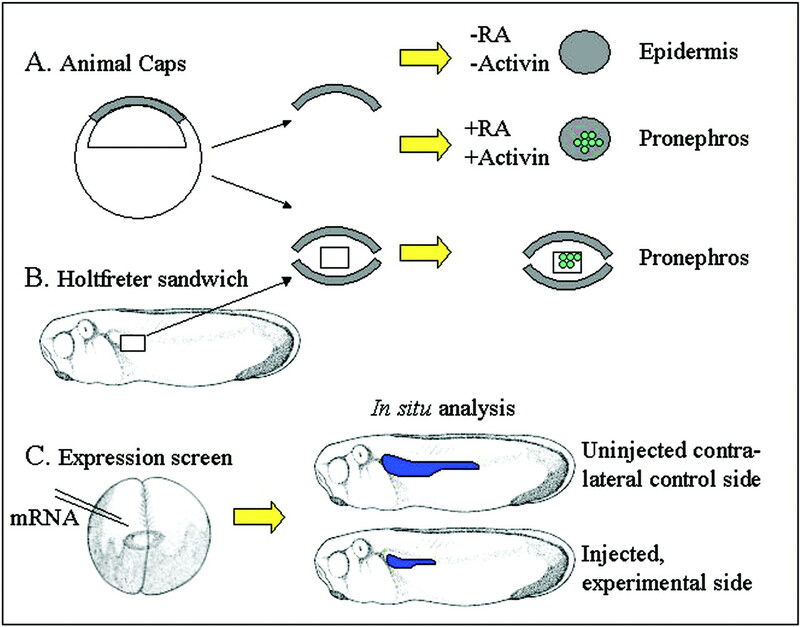 In these experiments, explants were taken from progressively earlier pronephros or presumptive pronephros and cultured between two animal caps in a Holtfreter sandwich until elements of the pronephros could be identified immunohistochemically or assayed by reverse transcriptase–PCR (Figure 2B). These experiments show that tubule and glomus are specified by stage 12.5 just after gastrulation and that duct is specified at stage 14. Also, it has been shown, by grafting experiments, that anterior somites can provide a signal that can convert unspecified intermediate mesoderm to pronephric tissue (13). These experiments have informed the search for the initial inducers of the pronephros, which is now being carried out by expression cloning. Because Xenopus embryos can be microinjected with ease, they offer an ideal system to assay expression libraries to identify gene function in the development of tissues and/or organs. The pronephros, because it develops close to the surface of the embryo and can be easily visualized by the expression of specific markers such as Xlim-1 and Pax8, represents an ideal organ in which to identify genes that affect organogenesis. Such large-scale screens have been carried out, the most notable success being that of Grammer et al. (27). A total of 50,000 clones from a tadpole stage cDNA library were screened in pools of 96 individual clones. The pools were transcribed in vitro, and the mRNA was introduced into one cell of the two-cell embryo to target one side of the embryo with the exogenous mRNA. Embryos then were cultured and assayed using in situ markers to define particular developmental structures. Pax8 was used to define the developing pronephros at stage 28 (Figure 2C). Pools with consistent developmental effects were subpooled, and 66 clones were identified with a definable biologic activity representing 57 discrete cDNA. Although pools were identified with pronephric disrupting activity, no specific genes were isolated with such activity. Grammer et al. (27) suggested that this might be due to the broad approach taken with both the initial library and the screening. A more specific screen using cDNA from more defined regions of the embryo might yield results in pronephric organogenesis. Because we now can identify tissues with biologic activities in the development of the pronephros, expression screening of this sort is clearly an attractive and a focused approach to identifying, functionally, the genes involved in the earliest pronephric events. The availability of full-length expression clones in X. tropicalis from four developmental stages will also increase the chance of identifying developmentally relevant genes (28). The ability to obtain differentiated pronephros from animal caps that have been incubated in retinoic acid and activin (see previous section) has also led to the successful use of differential hybridization or subtractive hybridization strategies to identify new genes with a functional role in pronephric development (20,23,24,29). These approaches have used the high level of pronephric tissue that differentiates in treated caps as a source of mRNA enriched in transcripts from pronephric genes. Two highly specific pronephric genes have been cloned after subtractive hybridization, which are not expressed significantly in other tissues: Annexin IV and XSMP-30. Two others, the zinc finger protein XCH3–3b and XCIRP the cold-inducible RNA binding protein have somewhat wider distributions. XCIRP-1, Annexin IV, and XCH3–3b all have been shown to have a functional role in pronephric development by either overexpression analysis or by morpholino oligonucleotide knockdown (Table 1) (24,29,31). The subtractive hybridization approaches just described are the most powerful ways by which to identify molecules that are active in pronephric kidney development, using the embryo itself as the experimental readout. New genes that have been identified through a functional screen have, by definition, a functional role in kidney development and patterning. However, for new genes that have been identified as being expressed in the pronephros, the next challenge is to identify whether they potentially function in developmental processes themselves. For higher vertebrates, the major techniques for analysis of function involve the production of either conditional or nonconditional transgenic animals. This is an expensive and time-consuming process that does not always lead to an analyzable phenotype, because of either functional redundancy or embryonic lethality. Xenopus, however, offers a system whereby overexpression by injection of normal or mutant mRNA or reduction of expression after injection of morpholino oligonucleotides can be achieved quickly and inexpensively (29). This approach has been used to great advantage in a variety of systems in Xenopus, including the pronephros (Figure 3). Initial studies focused on genes that were cloned in Xenopus and already had been shown to have a role in kidney development in higher vertebrates such as xWT1, Xlim-1, Pax8, Notch, Wnt-4, and Xlmx-1b (14–17,32,33). All of these genes have been shown to have effects on pronephric development (summarized in Table 1). These studies, however, add to our knowledge, because no mouse knockout has been analyzed at the pronephric stage of development, so the exact timing of the effect in higher vertebrates is unknown because transgenic embryos are analyzed only at later stages of development. Perhaps the power of the amphibian system is best exemplified as a means of analyzing genes that are expressed in the pronephros and for which no previous functional data are available. Thus Annexin IV, XCIRP1, and XCH3b all are shown to have newly identified roles in kidney development (Table 1) (24,29,31). One of the most significant advances in recent years has been the development of transgenesis in the frog (33–38). This technique involves the restriction enzyme mediated incorporation of DNA into the genome before the first cell division, thus ensuring that all of the cells of the subsequent embryo carry the DNA and that germline transmission from reared adult transgenic frogs is possible (Figure 4A). Both X. laevis and X. tropicalis have been used successfully in this procedure, which within a few hours of microinjection can generate hundreds of individual transgenic embryos. Many of the transgenic animals have been made with constructs that incorporate GFP as a reporter system to monitor expression (39,40). The external development of the tadpole allows the transgenic animals to be monitored at multiple times over the course of early development to establish the expression pattern of the transgene. Multiple transgenes have also been used both carried on the same plasmid and on different plasmids, which allow easy identification of transgenic animals as well as identification of overlapping regions of gene expression indicating potential interactions (39,40). Transgenic animals can either be studied in a transient manner or established as lines. It is at this point that the diploid genome and a generation time of 4.5 to 6 mo of X. tropicalis become significant advantages compared with the pseudotetraploid genome of X. laevis and a generation time of 12 mo or more (39). Transgenic animals can be used in identical ways to wild-type animals. Microinjection, grafting, and dissection all can be carried out, and genetic screening strategies are also being developed (40,41). Transgenic techniques are now becoming more refined, allowing more targeted gene expression. 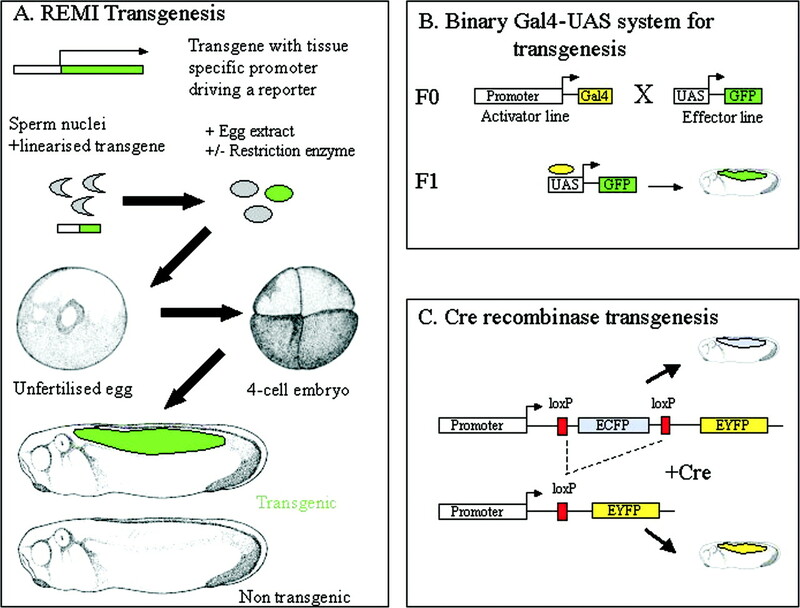 Four different approaches have been taken: The use of the binary Gal4-UAS system, the development of modified progesterone RU-486 and Tetracycline-on inducible systems, the use of heat shock-inducible transgenes, and most recently the development of a Cre-Lox recombinase system (42–45). The binary Gal4-UAS system was developed in Drosophila for targeted mis-expression (46,47). This approach depends on the generation of transgenic activator lines, which express the yeast transcription factor Gal4, and effector lines in which the gene of interest is flanked by multiple copies of the upstream activator sequences, UAS, capable of binding Gal4. Crossing two such lines will result in the expression of the effector transgene in the spatial and temporal pattern of the promoter driving the Gal4 activator (Figure 4B). Depending on the promoter used, tissue-specific expression can be achieved (42). This system can be made hormone-inducible if, in the activator line, the Gal4 activator is fused to the mutated human progesterone receptor and the VP16 transcriptional activation domain. Addition of the synthetic progesterone hormone analogue RU-486 will prevent sequestration of the fusion protein in the cytoplasm and, after nuclear entry, will result in effective ligand-inducible transactivation of the gene of interest (48). A similar strategy used a Gal4–retinoid X receptor α fusion as the activator transgene to identify naturally occurring retinoid X receptor α ligand hotspots after UAS-GFP expression in live embryos (49). For studying genes that are involved in relatively late developmental events such as metamorphosis, inducible systems are a major advantage. These systems allow potentially lethal transgenes to be switched on at a precise developmental time, allowing periods of effective activity to be assessed. In this way, by expressing a tetracycline-sensitive dominant negative thyroid hormone receptor, controlled by the addition of doxycycline, the period of time in which thyroid hormone controls innervation of the developing limb from the spinal cord has been established (40). The use of heat shock promoters can also temporally control the expression of the transgene, thus allowing the gene action later in development to be dissected from early effects of the gene (41). Recently, cryopreservation of sperm from a heatshock-inducible transgenic line opened the way for easier preservation of transgenic lines (50). 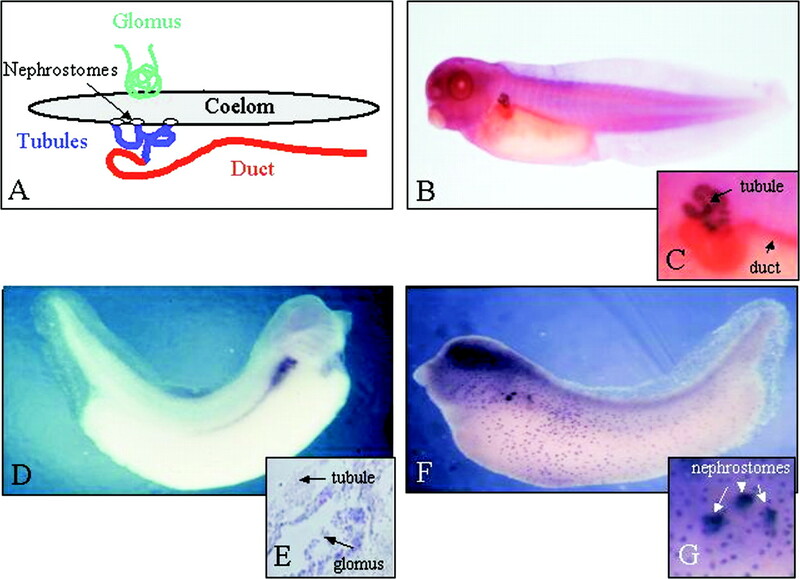 The Cre-Lox recombinase system has also been tested in transgenic frogs (45,51). Cre recombinase was introduced as a transgene driven by the muscle actin tissue-specific promoter. This transgenic line was crossed with a line that contains a reporter transgene that contains the cytomegalovirus promoter driving enhanced cyan fluorescent protein, flanked by lox P recombination sites, and enhanced yellow fluorescent protein (Figure 4C). Activation of the Cre recombinase in the muscle was associated with a color change in the reporter as a result of removal of enhanced cyan fluorescent protein and replacement by enhanced yellow fluorescent protein. These techniques are now ripe for transfer to the study of pronephric development. All that is needed is a reliable promoter to drive kidney-specific expression. The obvious candidates are promoters that drive highly specific expression, such as Annexin IV, from the earliest time of specification through to the time when the pronephros is functional. However, this has not yet been isolated. An alternative is to take advantage of the fact that promoters from other species can faithfully reproduce tissue-specific expression patterns in the frog (52,53). Although candidate promoters have been identified in mammals, they have not been tested extensively in the amphibian system (54–57). Once such promoters become available, they can be used to drive genes specifically in the kidney, which will further aid analysis of the functional networks of genes that are involved in pronephros formation. Targeting by transgenesis, however, is completely dependent on the availability of suitable tissue-specific promoters to target gene expression both temporally and spatially. It is for this reason that the technique of electroporation has been exploited for the delivery of plasmids to particular tissues and organs (reviewed in 58,59). This technique leads to fast, localized expression that has been particularly well exploited by chick developmental biologists as an alternative to a replication-competent retrovirus system for gene transfer (60). This technique has been applied successfully to Xenopus, in which electroporation into the neural tube in neurula and tadpole stages has been achieved (61–63). We are now applying this technique to the pronephros to specifically overexpress genes with potential roles in pronephric development and patterning (Kyuno and Jones, unpublished observations, 2004). In conclusion, the frog provides a simple model vertebrate system to analyze the development of the pronephric kidney, the first vertebrate kidney to be formed. The external development and ease with which the developing kidney rudiment can be dissected and/or grafted provide an experimentally tractable system that is not available in higher vertebrates. That kidney structures can be induced in vitro has made the identification of new genes, previously unidentified in kidney structures, a realistic proposition. This knowledge then can be transferred to higher vertebrate systems, where it may shed additional light on metanephric development. The frog provides an experimental system in which the function of genes can be investigated. This can be achieved by microinjection of wild-type or mutant mRNA, the effects being scored by analyzing the morphology and/or gene expression changes in the developing pronephros. This approach can be used for both frog genes and genes from higher vertebrates, including human. This has been exploited particularly in the study of human HNF1β (64,65). In this study, a frameshift mutation in HNF1β associated with renal agenesis is shown to have a similar effect on pronephros development in the frog. This opens the way for wider functional characterization in the frog system of such mutations that cause significant renal disease in humans. The development of genetic techniques such as transgenesis, whereby gene expression can be controlled both spatially and temporally, offers the real prospect of being able to characterize and generate the pattern of interacting genes in the nephrogenic network. Such network analysis will certainly inform the medical world and perhaps help in the identification of appropriate courses of therapy and treatment. Work in the author’s laboratory is funded by the BBSRC and the Wellcome Trust.